A.R.Rahman is a man known for his experimentations. The maestro who has so far been experimenting with sounds is now all set to experiment with the experience of watching a movie. Imagine what it would be to watch a movie as though you were inside the movie itself! That too inside a movie for which Rahman himself has written the script and composed the music. Very soon your imagination is going to become a reality because Rahman has built great expectations by revealing that 99 Songs, his directorial venture will be a Virtual Reality experience. 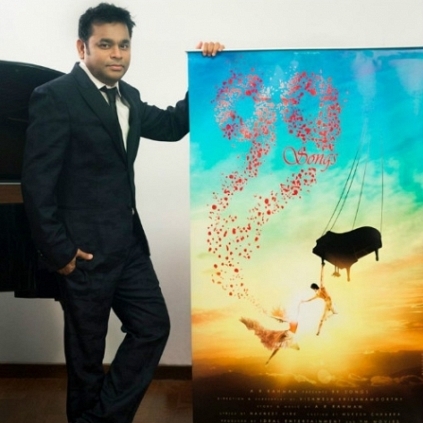 "Virtual Reality is poised to be the next 'big thing' that might change how we experience and enjoy cinema and that's why we're experimenting with a virtual trip to the world of 99 Songs”, said Rahman while announcing this news through his official Facebook page. People looking for online information on 99 songs, A.R. Rahman will find this news story useful.